It's been 30 years since the court took on an issue without waiting for a federal appeals court to weigh in. Francisco says the justices should hear arguments in April or a special session in May. The citizenship question is the third time since October that Francisco is seeking the court's intervention without an appellate ruling. The other two are Obama-era programs to shield young immigrants from deportation and allow transgender people to serve in the military. The Supreme Court hasn't acted on the immigration case, and an appellate court has since ruled on the issue. The justices on Tuesday denied early review of the transgender service policy, but allowed Pentagon restrictions that had been blocked by lower courts to take effect while the appeals process unfolds. 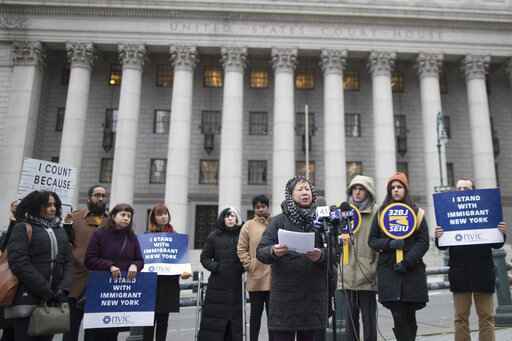 But 18 states, the District of Columbia, 15 big cities or counties, and immigrants' rights groups sued the Commerce Department, which designs the census, and claimed it failed to properly analyze the effect that the question would have on households with immigrants. The challengers said the Trump administration added the question to discourage immigrants from participating, potentially leading to a population undercount — and possibly fewer seats in Congress — in places that tend to vote Democratic. Furman ruled that Ross acted in an "arbitrary and capricious" manner and violated the law.